Should Europeans be encouraged to eat more sustainably? How can Europeans be encouraged to eat more sustainably? The food we eat has a massive impact on our health, but also the environment. In Europe alone, it’s estimated that half the population is obese or overweight and food accounts for almost a third of all consumption-derived greenhouse gas emissions. In some EU countries, more than 40% of produced food is being thrown away and wasted. Over the coming weeks, Debating Europe – in partnership with LiveWell for LIFE – will be looking at sustainable consumption, including how eating habits can have an impact on health, food security and the environment. Don’t forget to send us YOUR questions and comments in the form below, and we’ll add them to the debate. We’ll be kicking things off today by looking at the impact food choices can have on public health and the environment. I don’t want to pressure people into becoming vegetarian, but by just REDUCING meat consumption by even a quarter we would do the entire planet a gigantic favour. 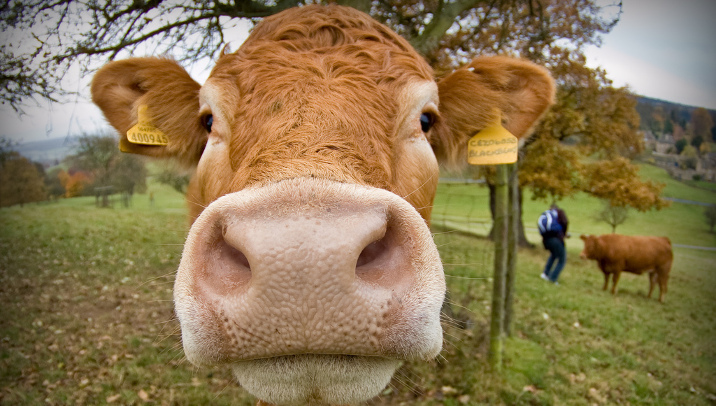 What would be the environmental impact of Europeans eating less meat? According to a new UN report, carbon emissions from agriculture could be slashed by up to 40%, air and water pollution levels could be cut, and cholesterol problems and obesity would be reduced if Europeans cut their meat and dairy consumption by half. We recently spoke to Roberto Bertollini, Chief Scientist and World Health Organization (WHO) Representative to the EU. How would he respond to Becky’s suggestion? We also spoke to Sue Dibb, Co-ordinator of the Eating Better project, a campaign which aims to encourage people to move towards eating less meat and more environmentally sustainable diets. Why does she want to see people eating less meat? How can policy-makers influence consumers to eat more sustainably? We had a comment sent in from Cris who thought the solution was higher taxes for junk food, sweets, and high fat foods, and lower prices for fruits and vegetables. What would our experts think? How do YOU think Europeans can be encouraged to eat more sustainably? Should policy-makers encourage people to eat less meat? Should unhealthy food cost more and fruits and vegetables be taxed less? And what’s the best way to influence consumers to eat healthier food, waste less and buy sustainable produce? Let us know your thoughts and comments in the form below, and we’ll take them to policy-makers and experts for their reactions. How can Europeans be encouraged to eat more sustainably? Eating meat is a myth and a cultural thing. Really! People simply think they have to eat meat or else their children will be undernourished or weak. And “simba”, the meat eating lion, is the image for real men! The facts about proteins (found plentiful in the vegetable world) the medically recommended levels of daily protein intake, the truth about antibiotics used, the facts about the damage to the environment, the cost structure of meat production/consumption in this globalized world, etc, should be taught to everyone. From kindergarten to PhD courses. Not just the nutritionists. And this should include “meat” as well as “fish”. As to taxation, it should be used as a parallel measure and not “the” measure, and certainly not as a long term measure, which it is not. Education and dissemination of well known nutrition information to all citizens is the long term solution. Europeans have to be brought into the issues so they can also participate in the solution as citizens, not just as tax payers. Taxes are the “stick”. Let the schools teach the benefit of good “less meat” nutrition and let the Europeans benefit being more healthy and having a less polluted environment. This would be the “carrot”. I agree that the key to influence consumers is through education. I think one major problem that consumers face when told to eat less meat is learning about protein substitutions. It is hard for them to envision other healthy and sustainable protein options. And once they know about them, how to actually prepare them. Perhaps, educating the public about the variety of healthy, meat-free protein options could be a way to start. Where’s the freedom to chose whotever you want to eat, to wear, to do ….? Stop subsidising sugar, fat and meat-related food production. If you want to subsidize green and leafy stuff: great. If you don’t want to: fine. But stop subsidising sugar, fat and meat. I would go one step further and tax sugar related products and ‘junk’ food. tthe question itself, shows how ridiculous modern world is, tthat should not even be asked, of course healthy food should be cheaper and produced in bigger quantitys than fast food…. Comone world, wake up…..
And eat more processed sugar. Reduce licenses for fast food chains, and you will see a drop in the meat eating habits of Europeans..we have one fast food in every block in most European cities. But wait. If you restrict the American fast food giants that are everywhere in Europe, uncle Sam won’t like it and he is going to spank the European governments, so that ain’t gonna happen.. Any other suggestions? Yes, decreasing their wages as troika is doing! Education is key. The multinationals with their marketing and lobbying also have a lot to answer for. Unlinking food prices from the global commondities market would help; Food prices should not be speculated on. Reduce food waste – the fact that food poverty and food waste co-exist is not acceptable. Food has lost its social context – cooking and sitting together to eat, talk and share; fast food not only lacks good nutrition, but all the other social and learning external benefits are also lost. Who is behind this campaign against meat? And why only meat? What if I decide to keep eating steak and to save the planet I use bycicle instead of car? Come on, stop dictating your vison and let us free to behave responsibly deciding how to contribute to a better planet. Now it’s lunch time, guess what?…I’ll have some meat with some vegetables…this is a balanced diet! Would we really improve such a utopian system by digging up some of the pasture and planting a monoculture of grain? Once you plant arable crops you destroy all the wild plants, vertebrates and invertebrates that lived on it and in it. You release stored carbon into the atmosphere and increase soil erosion. You have to remove trees and shrubs to get farm machinery in. You have to fence the area against deer and ramblers. Eventually you have to use fertiliser as the soil becomes depleted. Agricultural crops are the real environmental disaster. Their only ‘benefit’ is high levels of protein per acre, hence they can, theoretically, support a higher population. But why do we set so much store by this measure? Why not ‘biodiversity per unit protein’ which would place extensive animal systems at the top and cereal crops at the bottom? Finally, there is the question of whether grains can ever produce optimum human health. With 1 in 10 people now estimated to suffer from gluten related disorders, and with the high glycaemic index and significant anti-nutrients (lectins, phytates, oxalates etc) present in grains we need to question even the claimed health benefits of reducing meat consumption. we are clearly geographically in the same area…where are you based, and whats your contact details? What’s the difference if the vegetables are full with nitrat?s? definitely yes. A healthier populations costs less and produces more. ???? ????? ???? -??? ? If its fruits and vegs from permaculture or biodynamic farming, yes! They should’nt be taxed. Higher taxes for “junk” food and the prohibition to show publicity during cartoons and primetime. Answer is higher taxes for junk food and profit % for health care like tobacco. EU people simply need to be informed (or inform themselves) a little better and they will make the choices that are right for them. These are some of my personal opinions (and are probably far from perfect) which I believe highlight the difficulties that EU people encounter when trying to “know” what the healthy choices are. – vegetable is a healthier source of long term protein than meat. There is no rocket science here. Even cows know that but clear access to this information does not exist. 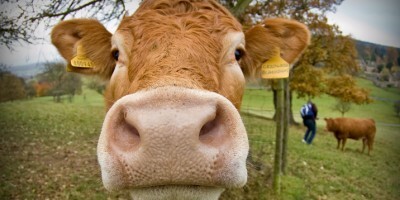 – blaming a cow that humans mass produce for greenhouse problems. Really? Is that how EU people take responsibility for their actions? – food tax does nothing except separate the rich from poor. What’s next? Tax good air and bad air. – corporate food policy influence in Brussels, skewed food industry sponsored science, food industry and food regulation revolving employment, EFSA’s so called “transparency” policy, and many other government/food industry grey areas totally undermine Europe’s “precautionary system” that we all think works so well. EU’s “High Fructose Corn Syrup food products are healthy for you” is recent testimony. 15 years of HFCS data from the US says otherwise. – bee killing chemical manufacturers (Bayer and Syngenta) are presently suing the EU because these chemicals have recently being banned. Why should the EU people be held to ransom for their environment and personal health by these companies? – apples don’t shine. It is the wax that they are dipped in that makes them shine. Washing them with water does not remove the wax. Like eating wax with your apple? – carrots are originally white, not orange. When last did you see a white carrot in your supermarket? Most of us don’t even know what the food of our forefathers looked like. – the nutrient values in many fruits have dropped in the last 50 years. Why? Because to make them “pretty”, they need to be hybridised or GMO’d and the sacrifice for pretty looking fruit is, amongst others, nutrition. – heard of the Mediterranean diet? It’s not a diet, it’s a marketing term – people have made fortunes by using this term and selling cook books. How many lives has it saved or prolonged? There is no proof whatsoever that the Mediterranean diet is healthier than any other diet. (If rubbish is repeated enough times, it is eventually deemed as fact). The origination of this term has a great story behind it though! The reality is that meat should cost 10 times more today if it was made the same way as 100 years ago. Once we understand how industry and government have managed to keep meat prices 10 times lower than it should be, then we will understand better and make the right choice to eat meat or not (or a lot less of it). To achieve this 10 times saving, sacrifices have to be made and it is these sacrifices that are making us and our food sick. If you continually insist to buy cheap food, you are fuelling this problem because it is your money that sustains it. Hamburgers are perceived as being unhealthy by the health conscious people. If it is made by the likes of Burger King, KFC, McDonalds, etc, you probably have a reason to be concerned. But if a burger is not made with pink slime, sugar, HFCS, canola oil, food enhancers, trans fats, fake salt, hydrogentated raw materials and so on …. should it still deserve its “bad” reputation? Big industry is corrupting our food in a bid to sell it cheap … and we unknowingly support this corruption every time we buy from them. Russia has just placed a moratorium on GMO food. Why? Because global science does not and cannot fully understand the full implications of cross geneing proteins in the food chain. If the EU thinks that their food science is right and the Russian food science is wrong, then EU consumers should prepare themselves for more food that is questionable, unsustainable, contaminated and unhealthy for us and our precious environment. I need to leave a healthy food environment and knowledge base (and alternative options) for my children, my fellow EU friends, family and citizens. It is really important that EU people educate themselves and get this right. Encouraging is a waste of time and money. The hard truth is the answer. Hard choices will reduce our gut line not sitting on the couch pretending there is nothing wrong with the EU food system. 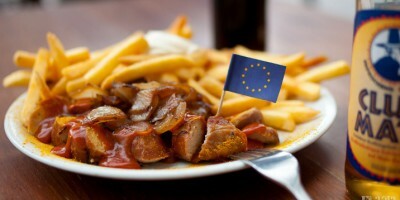 So … back to the question – Should Europeans be encouraged to eat less meat? I don’t think so. We are not the problem, we are the victims – and, yes, we should take some responsibility. We are sick and obese because the foods that we eat are allowed to be sub-standard by our governments and regulators, and, because we are not properly informed. Do you really think that by stopping to eat meat tomorrow will solve EU’s food related diseases? What about sugar in soft drinks, what about HFCS in almost everything, what about glyphosate on practically everything that grows, what about the BT toxin in Mon810 GM maize that is grown in EU? Come on EU … cherry picking is not the answer. Yes if fruits and vegetables are not bombarded with pesticides and dangerous chemical, as it is now the case. I would rather say: bio food should cost less, especially when it is regionally produced. Yes. Good food should be affordable. I agree, education is the key challenge towards sustainable diets. However, education implies that there is information for teachers to start from. Here, the role of researchers, and more specifically interdisciplinary cooperation between researchers, comes in. Universities should encourage such debate on sustainable diets and formulate a view that teachers in primary and secondary schools can build on. Fantastic reference material – thank you! Diet is such an important issue. Reducing the amount of meat in our diets is fundamental to addressing climate change, enhancing the security of food supply and improving the health and well-being of consumers. I have just written an article on Quorn’s announced investment which highlights the time is now for anyone in a position of influence to take action on sustainable food – there’s lots to be done! There are opportunities for retailers, producers and farmers consistent with such transition, for instance increasing the availability of vegetarian foods and making them irresistible to consumers or encouraging a shift from high impact meats (beef and lamb) to lower impact meats (pork and poultry). But changes such as these have significant implications for the structure and profile of farming in the UK and there is a need for robust policy and government support for activity which aids such transitions without isolating farming communities. everyones the same grow up! Compared with others, Europe can produced the finest and the healthier food on the planet, unless you are aiming for special/exotic eatable food. Not to bring in discussion how exquisite and sophisticate europeans can cook. So it’s not my main concern the quality of food that can be produced locally, but the agriculture for profit new trend that swept Europe starting last or two decades ago. The extensive forced hybrids crops that are replacing the natural pace grown ones, pollination with bees inside greenhouses, feeding cattle, piglets and poultry with the wrong type of industrial produced protein (Mad Cow Scandal, ring a bell?) doesn’t look like true alternatives. And one more issue that I would like to say it’s the fact that our metabolism doesn’t react too good at unseasonal type of feeding. Our diet shouldn’t be that radical different as our ancestors used to be. – diversified, natural over patented, unified GM foods. It is not possible to produce organic food on a scale that could satisfy the whole European market (extensive agriculture); the alternative is a decentralized approach, with villages and cities setting up more and more community gardens planted, tended and reaped by groups of families/citizens (autarchy). Moreover, in the larger cities, the EU member states should urgently invest in vertical farming experiments (i.e., agriculture in protected, energetically autonomous ‘towers’ where food can be grown on multiple levels, all year round, close to the consumers, without need for either pesticides or fertilizers – see the work of Dickson Despommier et al.). Here in the UK 70% of the farmed area is only good for grown grass. The best thing to do with that is use a ruminant to convert it into meat based protien we can digest. Extensive sheep and cattle production is totally sustainable, but the demand for ever cheaper food leads to mega farms and massive feed lots as we see in the United States. There is one sure way of stopping this happening in the EU and that is for everyone to pay significantly more for their food and then small producers will be able to carry on extensive production sustainably. when you want to reduce something in order to have beneficial effect to health, you should be ready to increase something else with similar effect . For example, the meat substitutes are a better choise and more ecofriendly taking the place of meat? The small farms in industrialized and polluted Europe can never be as efficient as farms in the Americas or Australasia. We should entrust our food production to the aforementioned and stop most farming in CAP-dominated Europe. Europeans consumers can play a key role (food democracy) in the promotion of sustainable diets, which should not only be seen in terms of environmental impact but also social inclusion and equity (providing and protecting jobs). Environmental impact should include green house gas emissions, contamination of land and water and management of biodiversity. Urban food governance and territorial planning are essential, and European consumers should get organized and engage wherever they live. Yes, and they must be encouraged to choose pasture-raised, high-welfare meat, eggs and dairy products when they do. Cheap meat is killing us – and destroying the planet. Reducing meat production would make the planet greener. However, less meat means higher meat prices. This means that economically weak families might not be able to afford to buy meat, which by all means is nutritional. So, instead of reducing the production, people should be encouraged not to waste meat. And the remainder could be shared to solve the world’s famine problems. We face a 70% food gap in 2050. The report gives recommendations on how to bridge that gap, based on sound a systematic analysis. An eye-opener!! You can not feed 7.125 billion people using sustainable farming, only increasing intensive farming methods will eliminate hunger world wide. The concept of sustainable farming is for people with more money than sense to ease their own conscience. YES! Not only eating more sustainably but also producing less food preparation waste and throwing away far less food from our plates than what we are doing today. The growing concern of people on this subject should answer this by itself. Of course we have to!! There are a number os ways to be more sustainable. Cowspiracy: The Sustainability Secret is ONE possible example, that sheds some light on the subject. Why don’t end subsidies on sugar, fat and meat? Would be easy and healthy. Go vegan. Support organic farmers. Produce your own food (or part of it) right in your balcony or yard. Educate yourself and educate others to the subject. It’s the only way we can get back the lost control over our health and over the food production system from big business. And how to make it possible for more citizens to produce their own food (or part of it)? That´s my question living in a small town but the lucky owner of a balcony high up meeting the morning sun. BIO Products, specifically those produced in Europe should be incentivated! Products not as healthy should be taxed, specially those from outside of Europe, in order that part of that tax can be allocated to the farmers producing BIO Products! First necessity goods should not be taxed at all. Products like fruit, bread, milk, cereal etc. etc. Alcohol, cigarettes and ssimilar hould be highly taxed. Now, about unhealthy food, are we going down the route of Mrs Empress Michelle Obama, who is dictacting to Americans what they can and can not eat? Needless to ask. Of course. Through basic income we are able to provide such foundation to each individual that they are able to budget their time and efforts much more smoothly in comparison to the current way of taxation in relation with the environment; landscape + society + productivity + renewability + consumption. Through basic income, not only income is the one that comes; tolerance, integrity, confidence, education, responsibility and actions based on these aforementioned appropriate variables bring in the last piece of the puzzle. Mutual consent and understanding is not far behind. Easy: ofcourse. Unfortently the induatrial food lobby is 7 times bigger than oil lobby. no TAX, TAX the Belgian highways to the car users and truck users, order Belgium state member to stop discussing between regions and order Belgium state to quit having the tax payer citizen to pull more money out of their pocket cause they don’t have no money anymore! Change, innovation are these in the EU vocabulary and strategic decisions? Private companies we work at ask us to embrace change and to come up with innovative ideas, so what are you waiting for rgds to the taxes? Unhealthy Foods should not be produced and fruits and Vegitables should be grown only naturually and Never Ever genetically. TAX Should and must Be Less Taxable ei less than 5%. Tax all non-biologically grown dood, meat products, and all food products not grown in the EU. The EU stands for gainful employment for all Europeans, not just the supermarket owners. YES, of course! But not the customers should pay more taxes or higher prices! The producers should pay more taxes on unhealthy food and products! I mean extra taxes for producing unhealthy food! People will buy anyway, no matter of the prise. But if the producers need to pay extra, they might find other ways/means to create heathy products to avoid the extra taxes, smth. like that! It goes without saying that normal food (called today bio ) should be much cheaper and more promoted everywhere…It is a stupidity of our time to have turned food into an industrial business with big power to companies that don’t care about the health of the people.We have no excuse nowadays to consume unhealthy food.one day or another,nature will make us pay for our greed. I’m sick and tired off “health facists”. Half population obese? Maybe in rich countries, i live in Lithuania, we earn enough to survive. 1.Meat is not a problem for obesity, high sugar carbonated drinks and low physical activity makes you fat, not protein. How fat are carnivores? 2.Greenhouse gas emissions? So dinosaurs farted and then got extinct? 3.Waste food could be used to feed humans or pigs or as biomass. 4.It is your choice to be fat and to eat whatever you want. Don’t eat meat if you think that what makes you fat. I agree! … And, for example, without even arriving at health benefits, I don’t even see any profit or any economical benefit (actually I find this one stupid) in making whole grains cost more than refined/partially refined grains. For refining the grains they have to remove (lose, probably) a part of the food, right? If anyone could explain me the least, I’d be very thankful! PS: I know once refined ones used to be more appreciated, but I am talking about the mentality, market and demand of today. Of course. Corporations will not allow any legislation with negative impact on their P&L account. MPs will be instructed by their leaders at the moment of voting. Nice idea, but not effective, as I wrote in my Bachelor’s thesis. Examples to be found in Hungary, Denmark and France. Ich finde nicht, dass Rindfleisch ungesund ist. Yes. Prices are a «direction mechanism» for consumers. If prices don’t reflext all costs (as there are externalities) and are disconected from civilizational values, then the misdirection of consumers trough devious market signals will deterirate our civilization. ESTAING is not just an economic activity or just satisfying a physiologucal need: «eating» is a culture, a «civilization». What we eat, how we cook it, how we cultivate, hunt or raise what we eat defines us; as a civilizations. Thus, «what we eat» is loaded with far more than «market efficiency» and «utilizarianism» and should not be left to the market alone. No brainer! That is if normal everyday people had a choice! Let’s get this one right: ECOLOGICAL food should cost less, unhealthy chemical food should be taxed. Yes! I’ve been calling for this for years!!! Yes ! EU should find a way or help farmers to sell their cheap fruit and vegetable direct to consumers. EU should care for people’s health and for farmers. I know how cheap we could produce fruit and vegetables and I know very well much consumers has to pay for it in example Germany or Sweden . Consumers very often pay ten times higher price for fruit than farmers get for it . That is crazy , people can’t afford fruits and vegetables and farmers could produce it very cheap . 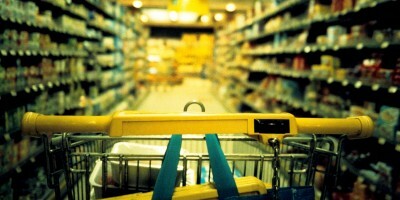 Supermarkets don’t care for peoples health , they just want to make money . I did some research on that problem and I could find out that supermarkets don’t like to sell plenty of cheap fruit because they have to work much more , better they sell less to higher price and make the same money on it . And who will be deciding what is healthy and what is not ? During my life i.e. butter was once healthy and after few years not and now it backed healthy again. I have better idea – let people to choose themselves. I mean all good shoul;d be taxed one rate only. If somebody wish to die because of unhealth food – well let him die. There is already too many laws coming from EU. So big NO ! bureaucrat shouldnt decide about that. Yes! For all living beings and for the planet. Yes, absolutely. In generally, unhealthy foods should be taxed more because ultimately it will translate to a higher public healthcare cost. YES!!! We would bring the obesity rates down and we would spend much less of our tax money for our health care providers to take care of fat people!! While at the same time unhealthy eaters would have to contribute more tax money as they are more likely to have health complications. We are paying for fat people to treat their problems while we could eliminate the problem at its root and pay less for healthy food! Tax reform on food is an absolute must. The production of modified cereals shoul be forbidden. Bann GMO and STOP TTIP!!! By not letting the EU have anything to do with it !, they have already destroyed the economies in most of Europe & the last thing we need is Brussels messing with the food supply. Please do not call us ‘Europeans’ it is insulting. For now we eat what is cheap. We also know Mediterranean diet is healthier but fish are expensive. So all meds eat pasta all over the year! It would help first if we knew what we were eating…. Yes, local sustainable healthy food should be preferred, also encouraged by all possible means. Right now it is the berry and mushroom season in Finland. If you go to forest to pick them yourself, its free luxury. I hate to say it, but I think the vegetarians may have a point when they say we shouldn’t be eating so many animal products. Large scale livestock ranching is horrible for the environment, and we need a more diverse crop on our fields anyway. Information and education. We don’t need all the meat and milk we eat and when we do we should be aware what we are eating, where it came from and how it was produced so that we can know the impact in health. By the way Brandbell report has 50 years and animals still live in very poor conditions. ..and cows to be encouraged to..fart more sustainably? Genetically modified crops will sort the vegetarians out! Everything we’re made to eat is harmful! Raise the tax on meat by 1000% and use the money to encourage farmers to farm vegetabes. First of all ban genetically modified products to be taken into the E.U.! If all European institutions were not capable of banning that and that rubbish is coming into Europe freely, even produced in Spain for example- what’s all that debate for and what the institutions are paid for?! Try to teach at school what means eat. maybe stop using cattle and start with buffalo. Dont import meat from England, they’re only in the EU for benefits! so does lack of it !! First we should abolish nationalistic baloney buy local and hate your neighbour. Why is the EU promoting quarrels between people? Encouraged? That sounds dangerous… Sounds like: “you are stupid; I, the commissioner, Will say you what you should eat”. Do not change my culture. I had enough with EU. If we want to eat fish and meat it is not up to the EU to decide. More importantly what will you do when the unelected European Commission ‘occupies’ your country with its own troops ? Help traditional ans short circuit agriculture. Save rural landscapes. Quite junk food and taste gastronomy with local, tasty and wealthy products ! Stop dumping agriculture. In one word, promote Europe, your Europe ! Eat more pig meat and use more lard !!!! Let us eat what we can, what we like. Let us be free. Trust us, we can make our own choices, stop manipulating people into buying only what corporation want. Are YOU prepared to change your shopping list in order to eat more sustainably? Do we know the real cost of the food we eat?